Adding the Sovereign cast limestone fireplace to your living space may be cause enough for celebration. 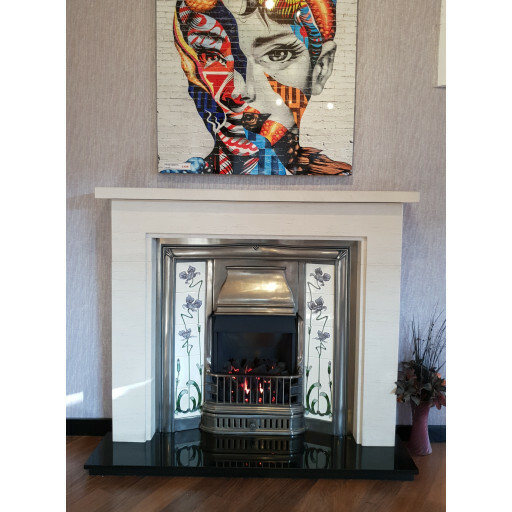 But you may find yourself creating excuses to entertain guests more often just so you can show off this handsome, beautifully crafted fireplace. The Sovereign cast limestone fireplace combines the best qualities of modern and traditional. This natural stone fireplace, expertly crafted using only the highest quality, fine grain Portuguese Limestone, features simple lines that exert a calming influence over any room where it is installed. Special features include a solid, cast iron insert to safely contain the fire. This fireplace offers the versatility of using a gas fire or electric fire application and it can also be modified for use with solid fuels. The Sovereign cast limestone fireplace is equally at home in a modest country house as it is in a historic city dwelling. The limestone carefully selected for construction of this unassuming fireplace is not only durable and meant to last over several generations, it also features a neutral colour that easily complements almost any choice in today's home décor. I recently moved into a terraced house and wanted to put some of the features back. I thought the fire would be quite a big layout but saw this in the Stockport showroom. It was a great price. I have had it fitted yesterday and my room now has a bit of character back, happy happy happy.